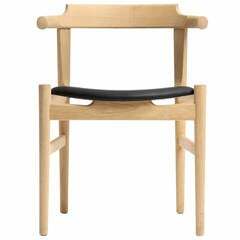 The Wayland Elbow chair is a quintessential dining chair for the contemporary dweller. It has a modest gesture of an arm, without the intrusiveness of one. The Wayland Line is our most extensive design family, offering side chairs, armchairs, dining and occasional chairs, counter stools and bar stools. You can outfit an entire house with Waylands. The Elbow is handmade in our Warren Rhode Island Studio from solid North American hardwood using time honored joinery techniques. O&G Studio's diverse range of signature stain colors lends their pieces to a wide variety of interiors from Traditional to Modern. This chair pairs well with Mid-Century Modern, Scandinavian Modern, and Transitional styles. O&G Studio designs and manufactures furniture that defies time and tradition, including the most extensive and evocative line of hand built Windsor chairs on the market. With a commitment to honor and built upon American design traditions, we look to the past for inspiration and reinvent the classics for contemporary living. O&G Studio designs and manufactures furniture that defies time and tradition, including the most extensive and evocative line of hand built Windsor chairs on the market. With a commitment to honor and build upon American design traditions, we look to the past for inspiration and reinvent the classics for contemporary living. O&G has been featured in The New York Times, The Wall Street Journal, World of Interiors, Architectural Digest, Elle Decor, Architects Newspaper, Interior Design, Dwell, Martha Stewart Living, the London Design Museum and was named by VOGUE as one of “ten contemporary designers to collect today." O&G is currently lead by Creative Director and Co-Founder Jonathan Glatt who lives and works in Warren, RI, where he leads a team of 20 with a growing portfolio, which includes a full range of seating, tables, lighting, decorative accents and hardware across four distinct product lines. An architectural, spare and refined armchair in soaped oak having a floating back rail with truncated armrests and a leather seat. 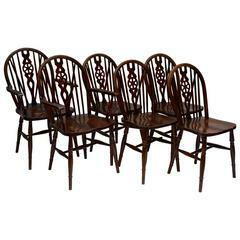 Set of four American wonderful quality Windsor dining chairs. Arm 25" H.
A fine set of four Regency period Anglo-Indian teak elbow chairs, the finely carved back sections with elaborate scrolls and foliage on well-turned tapering supports. 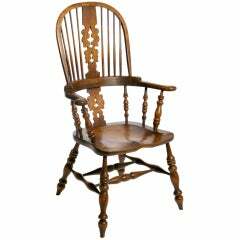 High back, wide seat English Windsor armchair made in the old world manner by English craftsmen. Complete sets available; price per chair. 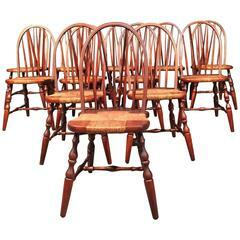 6 signed Nichols&amp;Stone Windsor dining chairs, circa 1930s, original rush seats. Chairs are in great condition. 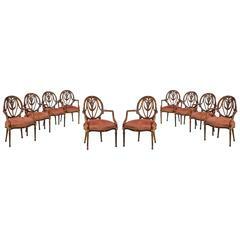 12 chairs in total available.